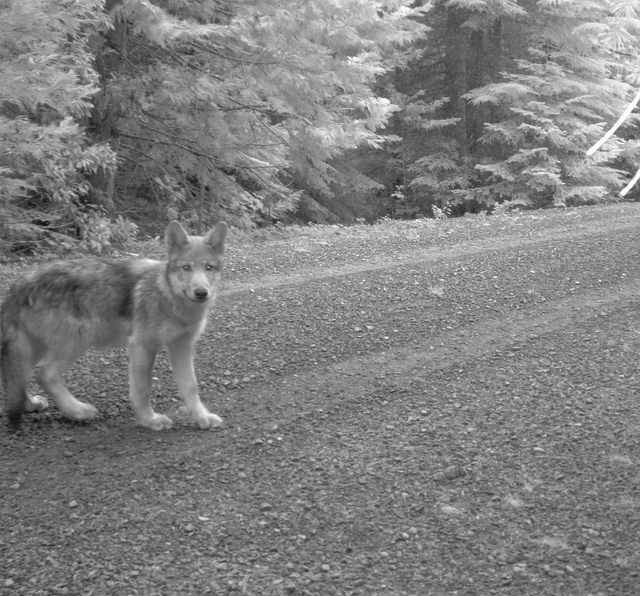 New photos show that Oregon's famous wandering wolf, OR-7, has at least three pups that he and a mate are raising in the Cascade Range of southern Oregon. U.S. Fish and Wildlife Service biologist John Stephenson said Friday that the photos taken July 12 by an automatic camera in a remote section of the Rogue River-Siskiyou National Forest show two gray pups. Combined with one black pup Stephenson observed outside the pack's den back in June, that makes at least three. OR-7 set off in search of a mate in September 2011, covering thousands of miles from his birthplace in northeastern Oregon to Northern California before settling in southwest Oregon. The wolf gained worldwide fame as his GPS tracking collar showed his wanderings.